On a sunny, cool day on January 13, 1968, Johnny Cash entered Folsom Prison, the notoriously tough California Penitentiary, and performed in front of 2000 inmates. And, their well armed guards, of course. But, the hardened, ballsy approach taken by Johnny Cash just doesn't show in his actions, it shows in the music, too. Sweet, soulful, and honest, its bullet-biting country madness seeps through every chord and word sung. This legendary concert is now being re-released with extensive liner notes, additional photos, and re-mastered for your listening pleasures. 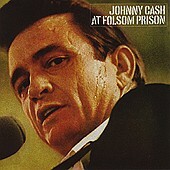 "Folsom Prison Blues" moves along with the "boom-chicka-boom" two-beat that Cash was notorious for. Fast, bluesy, and plenty of muscle behind it, the rhythm section has your feet tapping and hips moving while Cash's voice stings as he tells the tale of a man stuck in Folsom Prison, much like his audience. It takes balls to pull this off and Cash does it with perfection. "I Still Miss Someone" leans towards Cash's tender side as the rhythm section slows down (but keeps the toe tappin' beats plentiful) and his deep, rough voice reminisces through a tale of past loves. Quick and to the point, Cash has you eating out of his hands within one minute and thirty seconds. "Cocaine Blues" gets the crowd cheering with a murderous tale of a man and his troubles with women and the law. Cash laughs through the number right as he hits the audience with the most potent parts of the song. The rest of the time, he has you dancing in your seat, and I assume the prisoners were doing the same. Of course, the comical "25 Minutes to Go" is a spirited uplifter that is tremendously danceable as well as full of laughs. Cash himself even slips on a few parts as he goes from chuckles to full blown laughs on this crowd-pleasing number sure to put a smile on anyone's face who hears it. The thing that is so magical about Cash, and this show in particular, is that he can pull off this concert and have hardened criminals feeding off of it and enjoying every minute as well as the audience listening to it at home. "The Wall," "Dirty Old Egg Suckin' Dog," and "Flushed From the Bathroom of Your Heart" all show the tender side of the man who can have you weeping and crying within moments, inside the same song. Then "Jackson (with June Carter)," "I Got Stripes," and "Greystone Chapel" all get you up and out of your seats, dancing and wailing to his tremendously potent, working class country music that is as honest as anything can be. Here is the live album to end all live albums. Simply one of the best you'll ever come across. It doesn't hold back the punches, it isn't afraid to make you laugh, and doesn't hesitate to make you cry when it is desired. Here is one piece of Americana that should go without saying. I'll give it an A+.